Daily tips you can do right before bed to help you sleep through the night and finally get over insomnia. Your alarm goes off after eight hours of sleep and you wake up feeling like you’ve had all but one minute – sound familiar? Insomnia is becoming more and more common nowadays thanks to issues like stress and anxiety that keep you up (anyone else replaying that mistake you made today over and over again?). This feeling of exhaustion seems to last for the entire 9-5 grind, the post-work spin class you booked, and the long walk home from the bus station too. And ironically, you’ve dreamt of bed all day, but when you finally hit the pillow, you can’t seem to find the off button and your mind goes round in circles again. 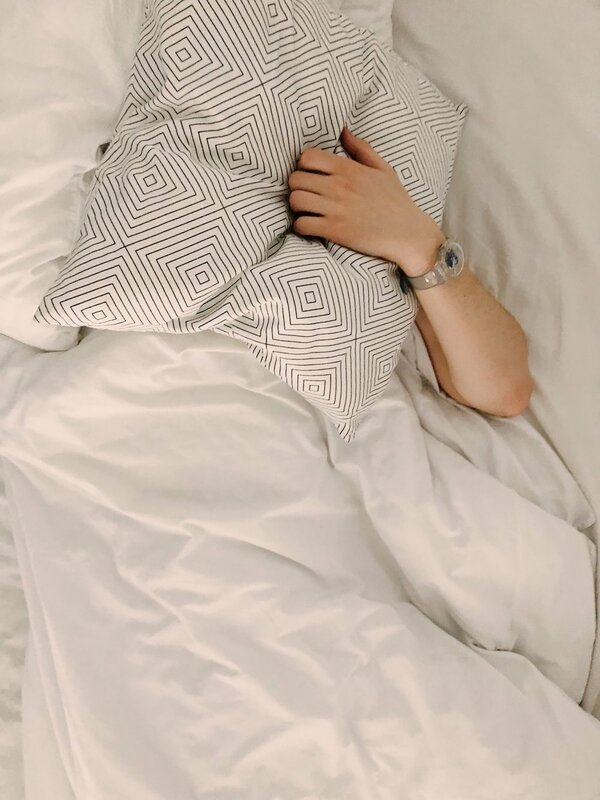 We all know that good nutrition and sleep (and the foods that actually help you fall asleep) are important for you to live your best self, so to help you on your way, Good Zing are sharing some zing-tastic pre-sleep habits that can help people like you get on the fast track to Dream Town. With so many helpful tips to help you get good quality sleep, here are the top 6 game-changing ways to get you there fast, naturally. How many of us scroll through our Instagram feed in bed trying to fall asleep? We tell ourselves we'll only look for five minutes, and one hour later we've Instagram-stalked our way to our ex-boyfriend’s mother’s niece's best friend’s page. So, step 1 is simple: put down the phone. Bedtime is for switching off, so make a rule to leave all digital devices aside at least half an hour before hitting the sheets. What about your alarm you ask? Traditional alarm clocks do the job too! Keeping your phone away from your bedside table ensures you won't feel the urge to scroll or squint your eyes from that harsh light. Slow down your brain waves by taking four deep breaths to the count of four and exhaling slowly to the count of four. Repeat this cycle three more times, sixteen breaths in all. Whether you drift off to sleep or not, this exercise can be highly restorative and restful – a study conducted by the University of Arizona's Center for Integrative Medicine shows that this breathing technique to help you sleep works fast because it allows the lungs to become fully charged with air, allowing more oxygen into the body, which promotes a state of calm. An overactive mind is the enemy of sleep. Take some time to let go of the day. Review what happened from start to finish. If there are any unresolved issues from the day, write them down on a piece of paper and leave them there for now. They can be addressed in the morning with a fresh mind and new thoughts. Journaling is a popular mindfulness tool people use to help them understand their anxieties – so by jotting them down, you are actually acknowledging them but then placing them aside to be faced at a better time, not right before bed. Avoid comparing your sleep to this artificial idea of what 'good sleep' actually is. People vary in their needs and natural sleep tendencies, and many researchers actually believe that bi-phasic sleep patterns are the norm for humans, as opposed to the idea of an eight hour continuous period of sleep that we as a society have been conditioned to believe is 'normal'. You may need 8 hours a night to feel energized and functional, but someone else could do fine on just 5, and another might need 10. Acceptance has a powerful, calming and healing effect. Releasing any tension in the body can really help in getting to sleep fast. Systematically explore your body from the feet up when you're in bed, noticing how each part of your anatomy seems to be right now, and invite it to soften, release and expand. While your body relaxes, see if you can allow yourself to mentally stay in that half-way space between fully awake and sleep. Allow your thoughts to drift softly and watch them with a sense of curiosity, rather the getting sucked into them. Serena is the founder and CEO of GoodZing — a website with a multitude of health and wellness advice from certified experts on anything from panic attacks to insomnia.